The Witcher 2 has been out on the PC for nearly a year now (May 17th 2011 was the release date) and the game has come a long way since the initial release with big updates coming in September last year with the 2.0 release and last week the Enhanced Edition was released at the same time as the very well received Xbox 360 version. 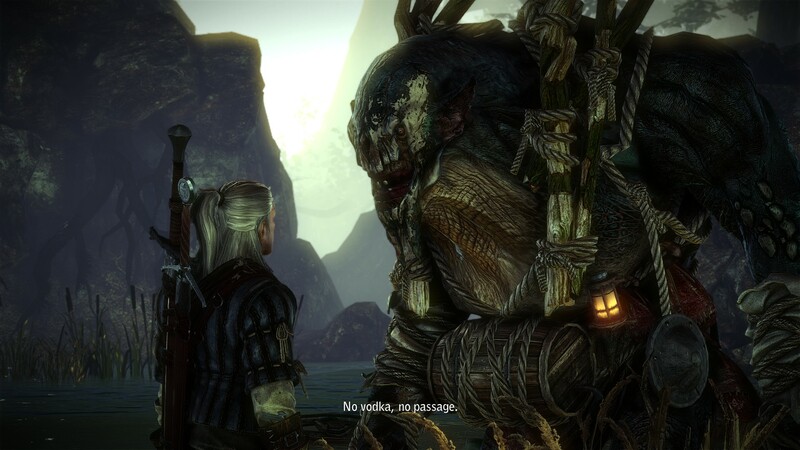 When I originally played The Witcher 2 at release last year, I was impressed by what the game was attempting, but I was left aghast at the difficulty of the Prologue and a poor hints and tips system which left me unsure how to use traps and bombs and little understanding of the different spells Geralt can cast. Nearly a year on and my experience of the first few hours is now much more enjoyable. Early game spoilers after the jump. First up, for anyone new to the series there is a lovely little animated sequence under the Extras menu which goes some way to explaining what a Witcher actually is. Even though I had played the original game and knew quite a bit about Witchers, this sequence is a nice refresher, and a must watch for anyone new to the series. The new opening to the game which features the assassination of King Demavend adds some much needed context to the scene in Chapter 1 where the Kingslayer talks to the elf Iorveth, a scene which left me just a bit puzzled after witnessing on first play through. More important for myself though was the new tutorial which gave me a far better understanding of combat than I had when I played the game last year. Whereas last year I fought just with swords and the Ignii spell, after going through the tutorial I was able to use traps and bombs, tools which make combat a much more varied and enjoyable experience. Indeed, the tutorial also provided me with a greater understanding of the magic Geralt has at his disposal which means I have started to use the full breadth of Geralt’s offensive arsenal to its full potential. Changes have also been made to the Prologue, while I am still puzzled by CD Projekt RED’s decision to let you play through Geralt’s story of the assault on la Volette’s castle in the order of your choosing odd, the entire opening is now much easier to progress through than it was at release, especially during your first encounter with that damned dragon. The difficulty of this section at launch was frankly ridiculous at nearly succeeding in putting me off the game entirely at the time. The new transitional cinematic between chapters is another welcome addition providing another much needed layer of context to a game which was quite short on it at first. Numerous new quests have been added to the game since launch with the biggest additions coming with the Enhanced Edition where two new quests in Chapter 3 add about four hours of gameplay, I haven’t reached that part of the game yet, but I am sure they add a lot to the final third of the game which some people said was lacking in depth on first release. What was a really good game at release have evolved, in my eyes at least, to a brilliant game thanks to the hard work of the guys at CD Projekt RED. To think these changes and additions have all been free updates for the PC game is testament to their commitment to customer service. Now, if you would excuse me, I am going back into the game. The only thing I regret about this game is not being able to play it with maxed out graphics on a PC. Looks b-e-a-utiful.